კრისტოფერ უოკენი (ინგლ. Christopher Walken, დაბ. 31 მელახი 1943) — ამერიკალი ოსცენე დო კინო არტისტი. ჩინებული რე 100-შე უმოსი კინოროლით დო ოტელევიზიე შოუეფს კათინით. ფილმეფიშ მეტი, ბორჯიშებორჯიშა მუსიკალურ ვიდეოკლიპეფსჷთ ოკათჷ (ფეტბოი სლიმი, მადონა, Journey, PIL, Run DMC, The Left Rights). ↑ Reid, Dixie. 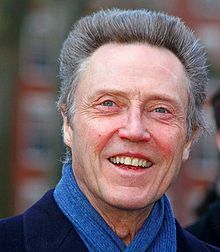 “Bend it like Walken: Actor has more to say about food and hair than acting.“, The Sacramento Bee, October 24, 2004. კითხირიშ თარიღი: October 25, 2008. დოარქივაფილი რე ორიგინალშე January 2, 2008-ს. თე ხასჷლაქ ეკონიას გეახალუ 23:33-ს, 19 გერგობათუთა 2016-ის.